Jade has been used by man for over 7,000 years and enjoys a long history in both China and India. The word jade, derived from the Spanish term for loin stone, "piedra de ijada," describes two different types of minerals: jadeite and nephrite. China is known for its jadeite, and India is known for its nephrite, even though both gems can be found in both countries. Mineralogists didn't differentiate between the two until the 19th century, when they identified each mineral's crystal structure. The stones are similar in appearance and composition and were used historically for art, weapons, religious symbols and currency. Jadeite is a silicate of sodium and aluminum and is rarer than nephrite and, therefore, more precious. It can be found in pink, violet, white and a host of other colors, though it is usually associated with green. Only very rare jadeite is uniformly colored; most stones are milky in appearance and contain streaks, blemishes or black spots. Imperfections in the stone don't necessarily devalue it and, in some cases, unique markings increase its value. Polished jadeite looks glassy and shiny on the surface, regardless of its internal coloring. Nephrite is a silicate of calcium and magnesium. 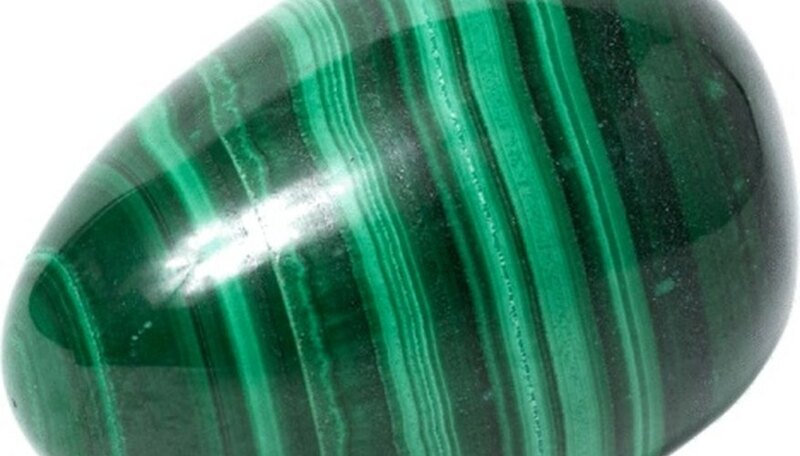 It can be found in abundance across the globe, so it's less valuable than jadeite but is used more often. Nephrite comes in a darker green but is found in brown, orange, white and black as well. It is slightly harder than jadeite and produces a more lustrous finish when carved. Nephrite is often sold on the market under the generic term jade to get a higher price. The ancient Chinese adopted jade into several aspects of their culture, using it in the same way as gold and diamonds in the west. They called it "yu," meaning "royal gem," because it was so valuable and symbolized the Confucian virtues of wisdom, justice, compassion, modesty and courage. Jade was used to make religious figures, fine art, jewelry, weapons and decorate the graves of imperial family members. The Chinese also attributed mystical powers to the gem for warding off evil and characterized it as linking heaven and earth. The hardness and durability of Indian jade made it perfect for weapons and tools, but it didn't enjoy the same spiritual status as Chinese jade. Indian jade today is usually sliced into thin pieces and then carved into jewelry that's sold all over the world. In this form it isn't considered valuable, but ancient or antique nephrite art, carvings and jewelry can get a high price at auction. Always determine the type of mineral, where it was harvested and when it was carved before buying or selling jade. Leslie Howerton began writing in 2008, and has been published in the "Kaleidoscope" newspaper. She received five Student Medallion awards for writing from the Public Relations Council of Alabama in 2009. She holds a Bachelor of Arts from the University of Alabama in public relations. What are Garnets Used for?